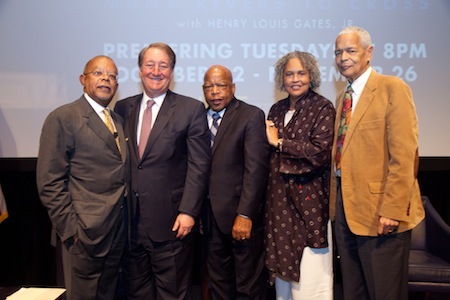 At an evening reception and screening in Washington, D.C., hosted by Howard and Abby Milstein, major civic and civil rights figures celebrated the newest PBS series by Professor Henry Louis Gates, Jr., entitled The African Americans: Many Rivers to Cross. The African Americans: Many Rivers to Cross is a six-part, six-hour series debuting nationwide on PBS in October. Released in conjunction with the 150th anniversary of the Emancipation Proclamation, the series chronicles the full sweep of African-American history. The Howard and Abby Milstein Foundation provided leadership support for the program, in partnership with HooverMilstein and Emigrant Bank. The African Americans: Many Rivers to Cross recounts the full trajectory of African-American history, exploring the evolution of the African-American people and their diverse cultural institutions, political strategies, and religious and social perspectives. Commencing with the origins of slavery in Africa, the series moves through five centuries of remarkable historical events. The dinner reception and screening at the National Press Club featured a panel discussion with Professor Gates, Congressman John Lewis, former NAACP Chairman Julian Bond, and journalist Charlayne Hunter-Gault. As one of the leaders of the Civil Rights movement in the 1960s, Rep. Lewis helped plan the historic “March on Washington” in August 1963, and is the last living speaker from that event. He was joined at the reception by a number of Congressional colleagues. Mr. and Mrs. Milstein are longtime supporters of both public television and various philanthropic and social causes. The African Americans: Many Rivers to Cross is the 13th and latest documentary film from Dr. Gates, and is a joint production of Kunhardt McGee Productions, Thirteen Productions LLC, and Inkwell Films in association with Ark Media. Major corporate support for the program was provided by Bank of America, The Coca-Cola Company, and McDonald’s. Major funding was also provided by the Ford Foundation, Dr. Georgette Bennett and Dr. Leonard Polonsky (in memory of Rabbi Marc H. Tanenbaum), Richard Gilder, the Hutchins Family Foundation, the W.K. Kellogg Foundation, and the National Endowment for the Humanities. Support was also provided by the Corporation for Public Broadcasting and PBS. On May 19, 2014, The African Americans: Many Rivers to Cross with Henry Louis Gates, Jr., received a Peabody Award for “providing a history lesson that is remarkably accessible and intellectually rigorous.” Calling the series “extraordinary,” and “the fullest television account of African Americans’ history,” the award citation lauds host Henry Louis Gates, Jr., and his team for combing through “five centuries of artifacts to find stories that inspire, unsettle, surprise and illuminate.” The Peabody Awards were created in 1940 to provide a counterpart to the Pulitzer Prize for excellence in radio broadcasting. Television programs were included in 1948, with cable programming added in 1981. “The Peabody Board is made up of scholars, media professionals, and journalists,” the organization website says, all 16 of whom must vote in favor of a nominated program.